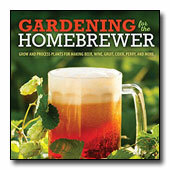 I recently concluded that gardening is a sport. It is seasonal, like many sports. We have specialized tools and an entourage of hats, gloves and knee pads just like any well-equipped sport. We sweat as much as any athlete during the height of their competition. Serious gardeners do intense workouts. We don't need fancy weight machines in our homes, or expensive health clubs. Unlike going to a health club, we actually accomplish something while keeping our bodies in shape. Instead of lifting weights, we lift soil, manure and compost by the yard-full. We pick up heavy rocks, containers and cubits of wet potting soil. The competition is fierce. We play a defensive position—like a goalie in soccer—holding weeds back from achieving a final score. We play offense, taking territory back from the wild things that grow on our property. We may not be offensive linemen on a football team, pushing back the defense, but we push mowers and wheelbarrows. 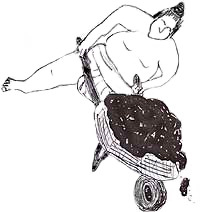 Like a Japanese Sumo wrestler using hataki-komi—a side step and push—we balance overloaded wheelbarrows. Unlike the trained wrestler, we don't put much ceremony in lifting the heavy and awkward loads. We look like we are doing the Sumo's ceremonial dance at the beginning of a match, lifting one leg sideways, rocking our bodies in the opposite direction, precariously balancing hefty materials on one wheel. This could be you at a time when a rarely invoked shini-tai (end of match) should be called because you are in an impossible position from which to fight a heavy burden. The wheelbarrow knows when to quit, unceremoniously tipping sideways and relieving itself of the burden. If your backs, legs, arms or shoulders collapse, you may be out with injuries for the rest of the season. Before stretching for any activity, breathe in and out, slowly and rhythmically; do not bounce or jerk your body, and stretch as far and as comfortably as you can. Do not follow the "no pain, no gain" rule. Stretching should not be painful. Like athletes, we can injure ourselves, because unlike the wheelbarrow, we don't always acknowledge our limits. We may not know how to throw a fast ball, or tackle a running back, but we toss dirt clods and rocks, wrestling our gardens into shape. When I went to my chiropractor for shoulder pain that wouldn't go away, I was diagnosed with an injury usually relegated to baseball pitchers. An injury like mine wasn't from throwing a fast ball at an imaginary brave batter. The actual cause is unclear; however, the kind of work I was doing in the garden is most likely the source. I picked up too many one-man rocks from a half-man rock pile, or maybe I moved right when left was the best option. Other reasons for the injury may stem from not warming up properly, not stretching, or pushing my body past its physical limits. Before you begin any garden chore, stretch for 10-15 minutes. Some time during the chores and after you finish, repeat your stretches. Try not to overdo it at first; however, if you find yourself stiff or sore after working in the garden, use ice packs to help with the discomfort. As I found out the hard way, it is easier to take care of your body than heal from harm our sport can inflict upon us. Take care of yourself! Don't let an injury keep you from signing on for another season of gardening. When raking, stand straight and keep your head up. While you rake, assume a scissors stance, right foot forward and left foot back. Reverse feet every few minutes to avoid repetitious movement in one area of your body. Bend at your knees, not at your waist, when you pick up grass or leaf piles. Keep the amount you pick up small, to avoid unnecessary back pain. Replace your rake with an ergonomically designed one.